If I had a dime for every watermelon I've cubed up this summer I'd be living pretty large! I was given a set of the Maldon Triple Gift Pack & never really knew how to best use the smoked salt. But, eventually, it hit me it would be awesome with melon & it is! Think prosciutto with honeydew melon - it's a little like that delish combo. Really, give it a try. 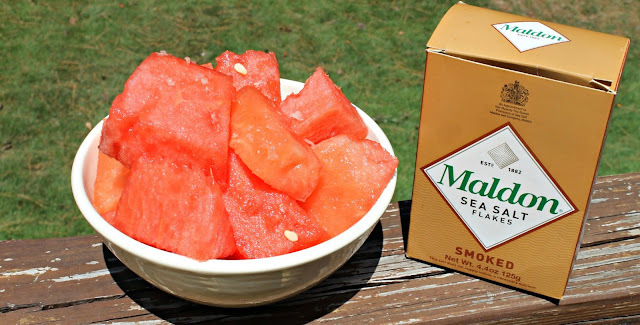 If you don't want to go through the hassle of ordering salt online (but, honestly, Maldon is so worth it) or finding it in a local shop, try some plain or kosher salt if you've never tried salted melon. Salt makes everything taste better. It's probably possible to make a DIY version of smoked salt (Pinterest?) using liquid smoke which is available at most grocery stores - I've never tried it, but maybe I will when this box runs out. Salt can be flavored with almost anything so I am thinking maybe some salt with lime zest would be delicious with melon too. Do you have a favorite way to eat watermelon? ps. smoked salt is great on popcorn too!